Check out the second issue of our newsletter, where you can find stories about our alumni and news about upcoming events organized by the Youth Chapter. The Past vs. 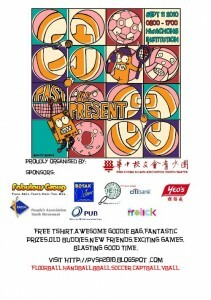 Present is an annual event organised and held by the Hwa Chong Alumni Association Youth Chapter. This event promises to be a day of fun, bring both past and present students of Hwa Chong together at their alma mater for various sporting competitions. The games that are contested include Basketball, Street Soccer, Captain’s Ball, Volleyball, Floorball and Handball. For more details regarding the event, please refer to our event blog. Spike2010 was held successfully on the 31st of July with as many as 164 participants enjoying the fun in the sun at Tanjong beach Sentosa. Together with the superb weather, great music and free-flow of drinks, our participants battled it out in both the 2 on 2 men’s and 4 on 4 mixed category. The standard of competition was rather high, and the atmosphere was easy and casual. Remember to check out our Facebook page for some awesome photos from the event! We had the honor of inviting Mr Chan Soo Sen, as the guest of honour for the event. Overall, Spike2010 was a blast and we’re looking forward to the next SPIKE! Spike2010 is a beach volleyball that aims to promote social cohesion through beach volleyball by strengthening community bonds. The event will be held on the 31st of July at Sentosa Tanjong Beach. It is jointly organised by Hwa Chong Alumni Association Youth Chapter (HCAAYC) as well as Siglap South CC Youth Executive Committee (YEC). It is also sanctioned by Volleyball Association of Singapore (VAS).